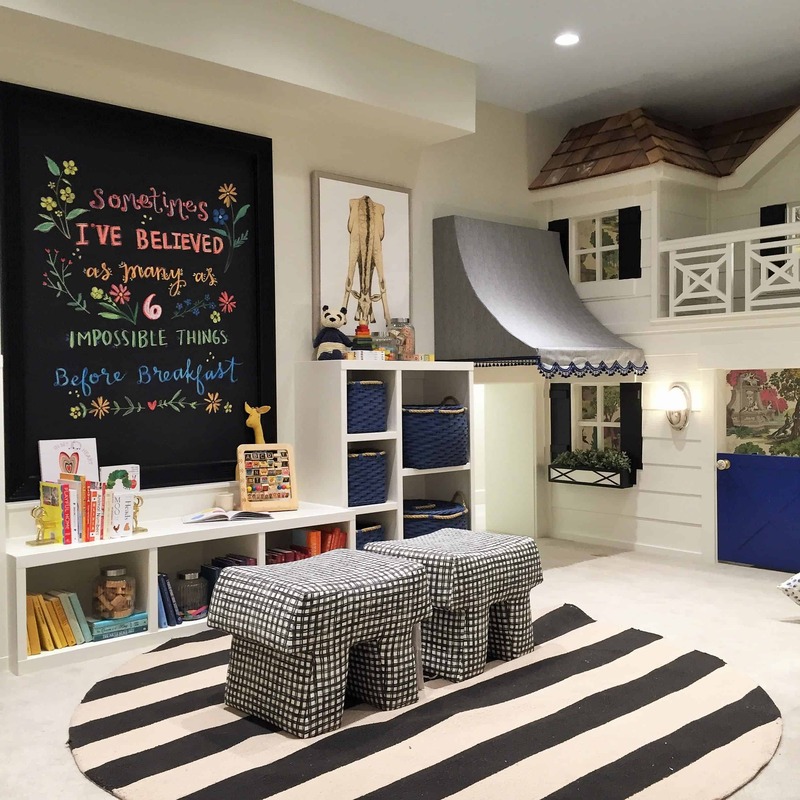 .Most parents know the playroom tends to become the room, toys are simply thrown in and most unused furniture pieces get placed around for some sort of seating area. 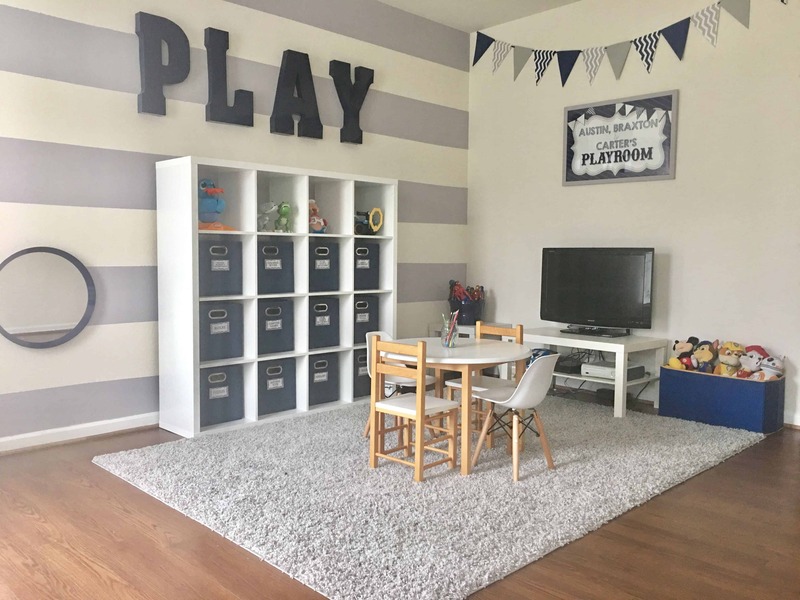 We all know the playroom isn’t necessarily the most decorated space or even the most thought of room instead of its simply “there.” However, that is until now! With a little bit of consideration, your kid’s playroom can become one of your personal favorite rooms in your home. 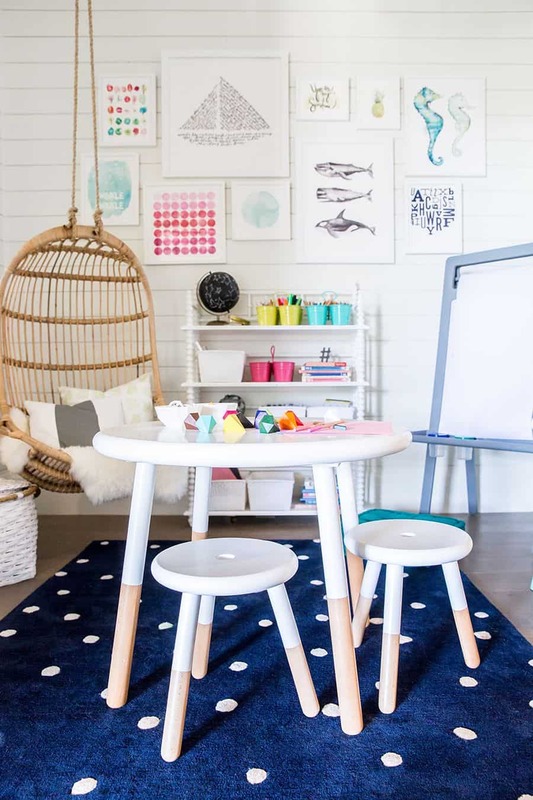 Here are 10 stylish playroom ideas that will inspire you to redecorate your kid’s favorite space in the home. Instead of having a chalkboard consider having chalkboard walls, they not only make a statement, but they make the room feel grander as well. Chalkboards are no longer only a part of schools or teachings, they are now becoming a part of the home. We have previously mentioned chalkboards as part of the kitchen, but now they are coming to the playroom. Add a chalkboard wall for an added dose of imagination where your children could draw, learn or even teach each other something new. For that upscale, stylish touch add a simplistic wallpaper with a monochromatic appeal. 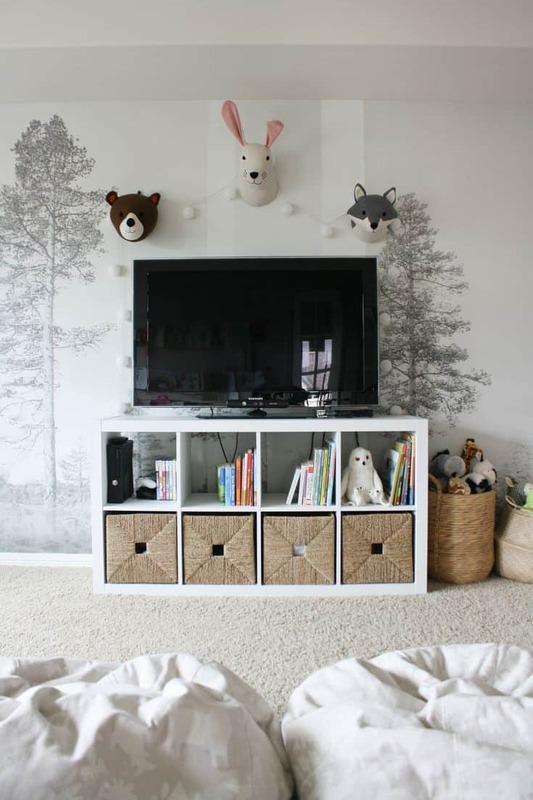 Just like any room, wallpaper makes a huge difference and the playroom is no exception. A tranquil wallpaper will make a brightening effect in the room with a hint of charm and style. Instead of using a child-like wallpaper we recommend going the extra mile and choosing a more upscale look with color and pattern. Consider a textured tent to add additional color and texture to the room in a seamless manner. Tents have become a beautiful element to incorporate into the home, not just for a Boho vibe but for a more unique feel. There is just something about them that makes children want to engage in creativity and side or play around them. A tent is one of those decorative pieces that are multifunctional- they look great and can be played in as well. If you do not want to add books to your bookcase consider adding storage bins to give you a more put together uniform look. Adding books to a playroom is always a great idea! Not only are you opening the doors to your child’s imagination, but it allows your child to want to read books on a regular basis. In order to have these books you need to have a bookcase, we recommend having a built-in bookcase. A built-in bookcase is great because it takes up little room yet makes a huge impact. 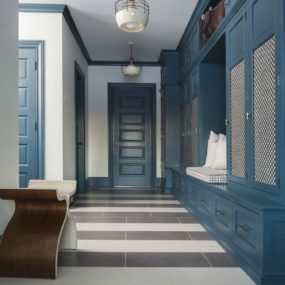 Hints of blue can be incorporated by adding different storage hints or even having blue decorative elements. Blue has become such a universal color that it simply works well in any room and a kid’s room is no exception. Add a blue wall, a rug, or even accent pillows with a blue pattern to brighten the room and showcase the color in a cohesive manner. Why have one window nook when you can have two? Consider taking two windows and making nooks for each of your children. If you have a child that is intrigued by nature or everything that has to do with the great outdoors, give them the joy of a window nook. Window nooks are great for those that want to sit and embrace everything that is outdoors after a long day. Add a comfortable pillow or cushion to the area to make it feel cozier and more stylish while still having a relaxing nature to it. An accent wall is great for those that want to brighten the room but can’t seem to achieve it with the simple use of color and decor. 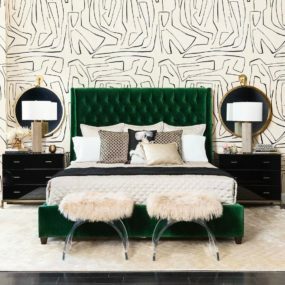 Whether you want to add a welcoming touch or something bold and daring an accent wall is a way to go. To achieve this, consider a wallpaper or a painted mural. You might even want to take into consideration painting half of your wall in a bold hue for a beautiful display that does not take off the room and its décor. 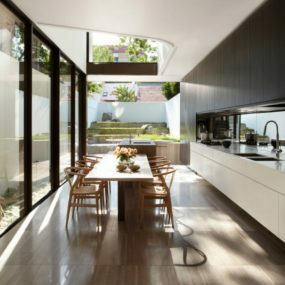 Consider adding more than one style of seating in the room for a beautiful contrast that brightens the space overall. 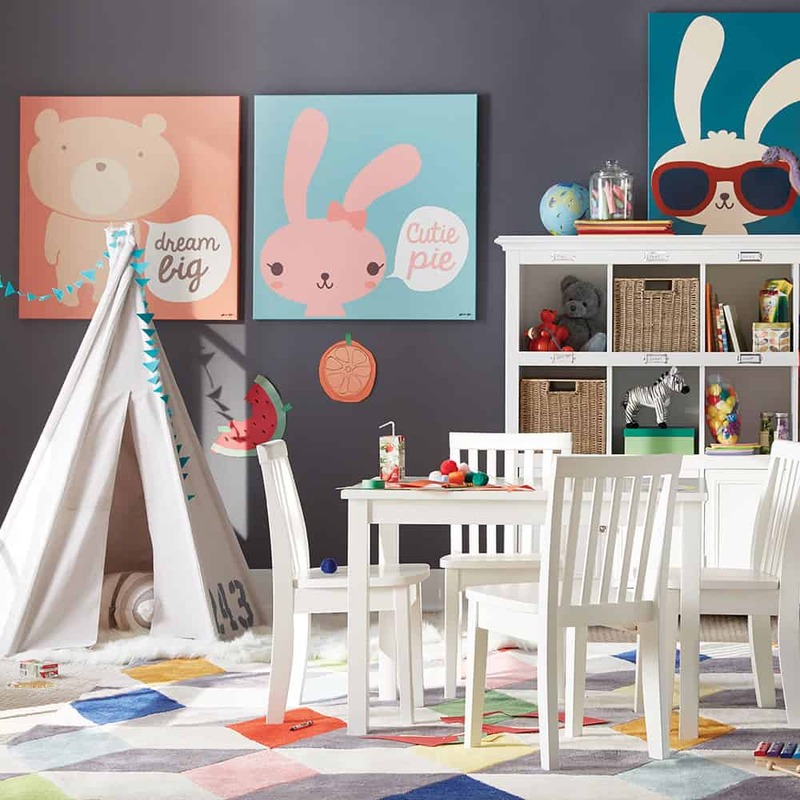 Having a simple seating area in your playroom is always a great idea, regardless of how much usage you get out of it a chic table with two or more chairs will bring the room that stylish all-in-one feel. Having this feature will ensure your kids enjoy being in the room often. When selecting a rug, consider a colorful option to bring that seamless pairing in the room. We love the idea of having a rug in the room, it’s almost a necessary item in the space. The rug will not only make the room feel more put together, but it’s also a safety net for those that have smaller children. Add a patterned rug or even a textured one with colorful bits. When going for your decor select a functional look that is also used throughout the room. You want every piece to work well in the entire room time and time again. When selecting the furniture for the room, the main focus is to purchase pieces that are functional yet are stylish. 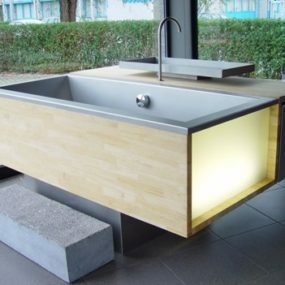 You want functional, so your pieces that take up most of the room can be used for numerous different things. 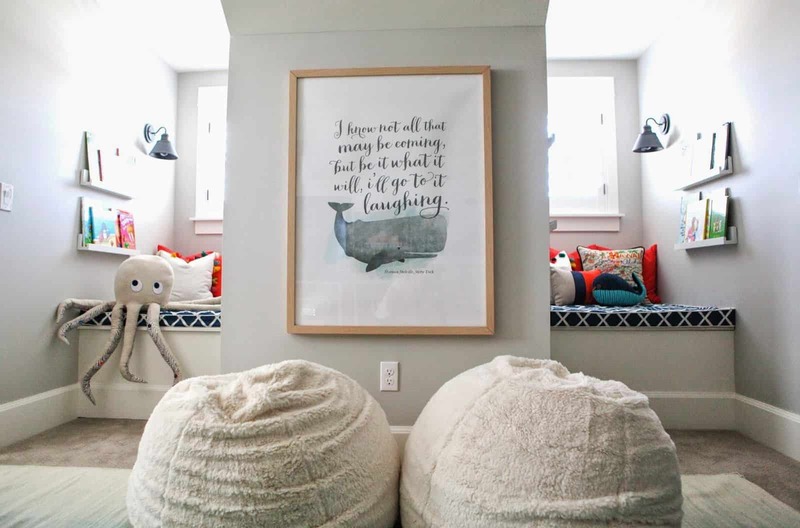 How do you typically style your kid’s playroom? Share with us some ideas below.